Courtiers feasting at elaborately set tables, knights in gleaming armor, a richly clad monarch presiding over elegant festivities: such was life at the medieval and Renaissance courts of Europe. Monarchs and nobles affirmed their power and political authority through pageantry such as hunting, jousting, and banqueting. So too, the visual arts—illuminated manuscripts, paintings, drawings, enamels, and textiles—actively helped to construct a court’s political and cultural identity. 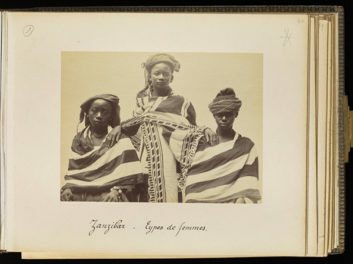 Such trappings were meant to inspire awe, announcing the wealth and vitality of the kingdom not only to visiting dignitaries and rival princes but also to the monarch’s own subjects. The exhibition All that Glitters: Life at the Renaissance Court (on view at the Getty Center from August 28 to December 2, 2018) presents a glittering array of objects from the courts of Europe ranging from illuminated manuscripts to luxury textiles and decorative arts. This post introduces several of the objects from the exhibition. The court was a space of leisure, entertainment, and display. Members of the aristocracy spent their time in tournaments, hunting, feasting, and games such as chess, all in a sumptuous and visually captivating environment. Courtiers were served the finest food and drink in elegant vessels, while musical entertainment further enhanced the social theater. The spectacle delighted courtiers, but it was also intended to remind them of their monarch’s magnanimity. Manuscripts that recorded such courtly pastimes were valued as luxury goods. Hunting was one of the most popular and exclusive leisure activities for courtiers. 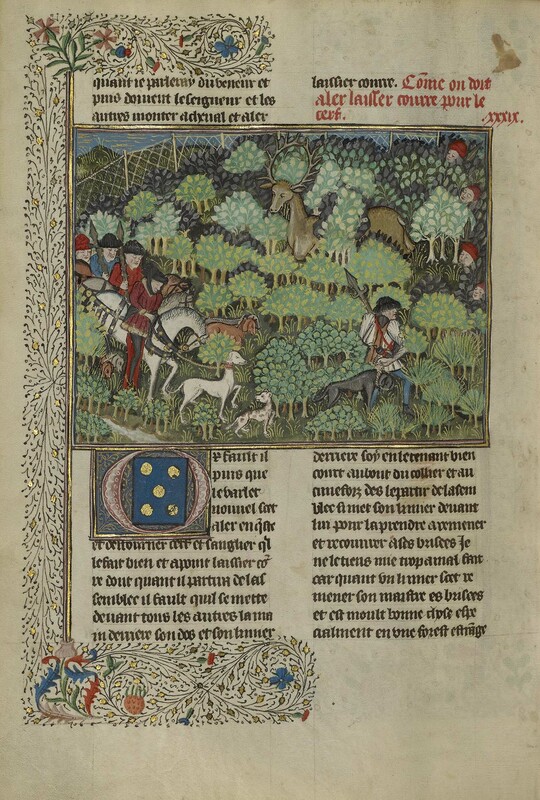 This lively image of a hunting party in pursuit of quarry appears in a popular manual on the subject. A series of stylized images reminiscent of tapestry depicts every aspect of the hunt, from types of hounds to methods of camouflage. Only nobility of the highest rank engaged in hunting, which was taken seriously not only as sport but also as an enactment of chivalric values and a confirmation of social hierarchies. Large parties of men and women engaged in hunting, often showing off the latest fashions in silk and fur. 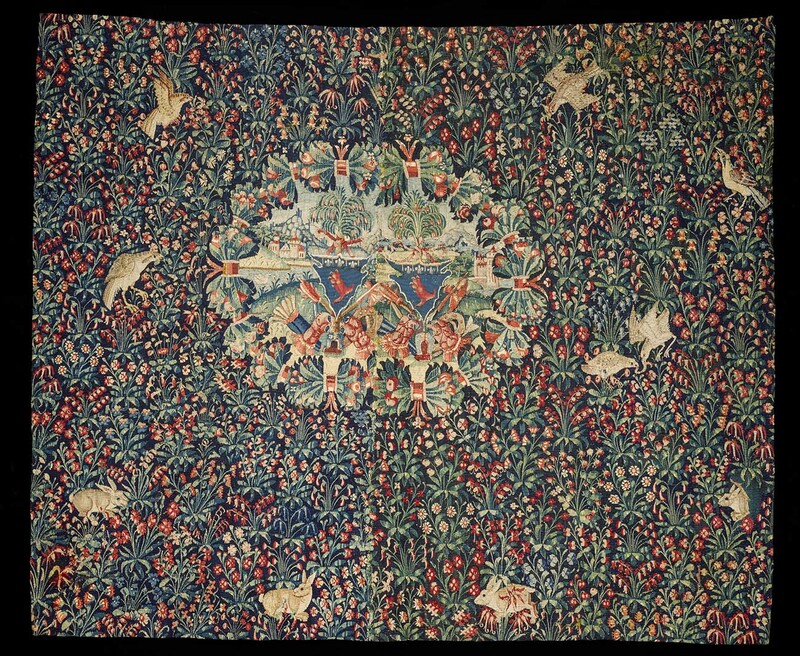 Luxury textiles were an important part of the courtly visual environment, and took the form of tapestries used as room decoration as well as clothing. At the center of this tapestry is a complex armorial arrangement: statements of familial identity were literally woven into the households of the nobility. Many kinds of small flowers and plants are arranged around the central heraldic display on a dark ground, giving the impression of a verdant meadow. This type of tapestry, called “millefleurs” (thousand flowers), was one of the most popular types of domestic textile among Europe’s elite. A signature feature of an elegant home, tapestries were often commissioned in sets and hung in an arrangement that created a unified visual impression. They also served the practical function of insulating large, drafty rooms. combat. By this period, gauntlets were made of fabrics such as silk, velvet, or satin. 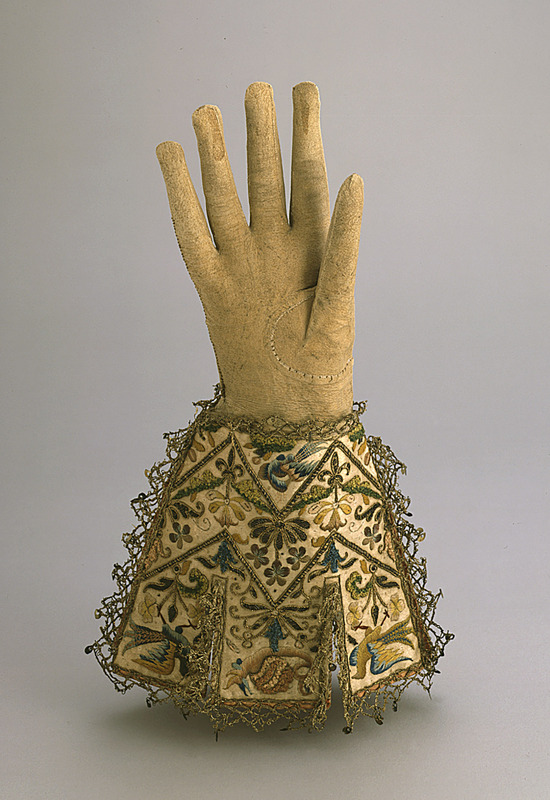 First owned by Thomas, Lord Fairfax (1560–1640), this pair of gloves is especially chic. It features supple goatskin glove-hands, tabbed cuffs, a scrolling floral motif embroidered in gold thread, and edges lined in gilt lace. The right to wear such gloves was the exclusive privilege of the nobility, protected by laws that regulated attire according to rank. Lords and ladies, and even kings and queens, observed strict rules of comportment, and a deeply ingrained sense of social hierarchy dictated every aspect of daily life. The adherence to chivalric code and the way it governed both belief and behavior at the Renaissance courts was established earlier in the Middle Ages, but emerged with renewed vigor during the late fifteenth century and continued throughout the Renaissance. Rank determined a courtier’s physical proximity to the monarch, including where he sat at the banqueting table, as well as his right to wear certain luxury fabrics. Such protocols demanded a delicate dance of proper etiquette from courtiers, as well as vigilant attention to systems of heraldry expressing family connections, ownership of certain lands and territories, and membership in official military orders. In the exhibition, a number of dazzling and complex objects including manuscripts and stained glass explore the display of heraldry at court. 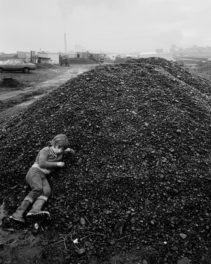 Genealogy, and the ability to trace one’s lineage back for generations into the medieval and even ancient world, was also of primary concern at court. It is reflected in this manuscript, which describes and illustrates the long line of the Hohenzollern family of Germany as a series of patriarchs centered under classical arches. 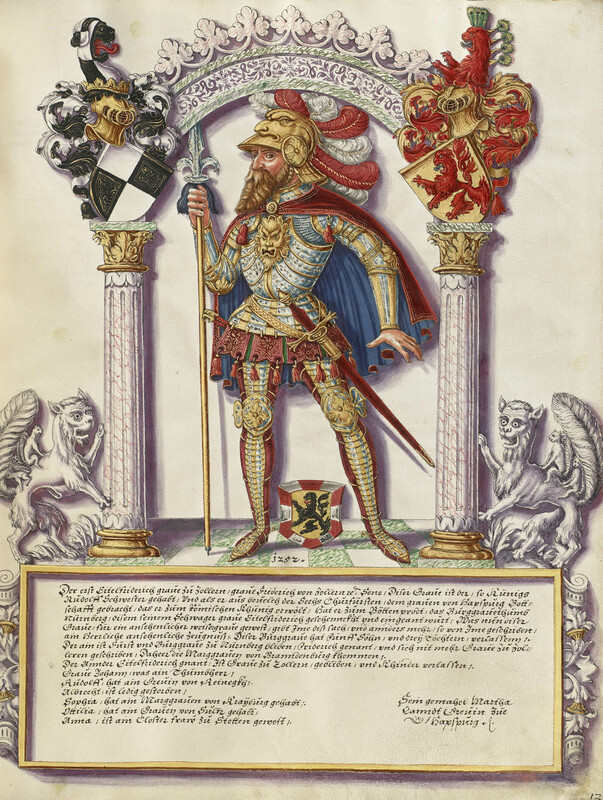 Eitelfriedrich I, Count of Hohenzollern (1545–1605), appears here, resplendent in a full suit of armor and framed by his family’s heraldic colors and symbols. The House of Hohenzollern traced its lineage to the eleventh century. This text, illustrated in the late sixteenth century, recounts the lives and deeds of the family’s patriarchs in the Holy Roman Empire, encompassing what is now Germany. The images present a portrait genealogy of the men within architectural settings that identify them as the inheritors of the glory of ancient Rome. Handed down through the family for generations, this record served as a continual reminder of an illustrious past. Heraldry was one of the primary ways that people expressed their genealogy and official status at court, and their peers were highly adept at reading these complex arrays of personal and family symbols. This manuscript, for example, contains a heraldic frontispiece that was added nearly 100 years after the book’s original production. The dukes of Normandy claimed descent from the Viking ruler Rollo, the first to govern their territory of Aumale in northwestern France. Treasured manuscripts were passed down through generations of family members or acquired by collectors who added their personal marks. The family lineage and ancestral deeds recorded in the manuscript above, originally produced between 1400 and 1415, may have held particular meaning for Claude of Lorraine, a sixteenth-century Duke of Aumale: he appended this array of family symbols surrounded by the collar of the knightly Order of Saint Michael. 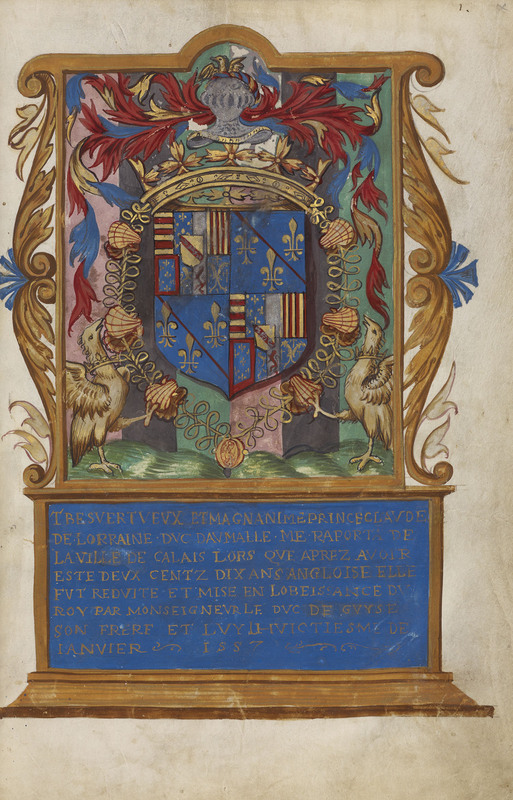 The armorials accompany an inscription describing the “very virtuous and magnanimous” Duke Claude, celebrating the century-old tome as a worthy addition to his collection. Decoration in aristocratic households was also mobilized to communicate heraldic messages. 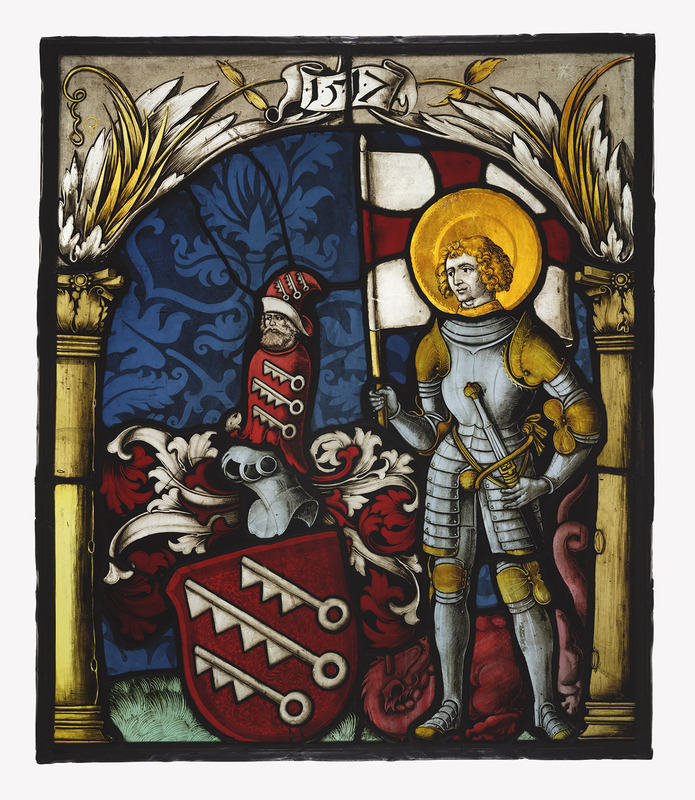 This small glass panel combines armorials of the noble Speth family of Mainz, Germany (three keys upon a shield), with their holy patron, Saint George, who appears in a full suit of armor. Heraldic motifs displaying family lineage were a favored subject in stained glass panels, which featured a complex language of armorial symbols intelligible to courtly peers. For commissions by noble patrons, artisans created sophisticated illusionistic effects with vitreous paint and silver stain: the delicacy of Saint George’s curls and facial expression demonstrate the close relationship between glass painting and draftsmanship during the Renaissance. 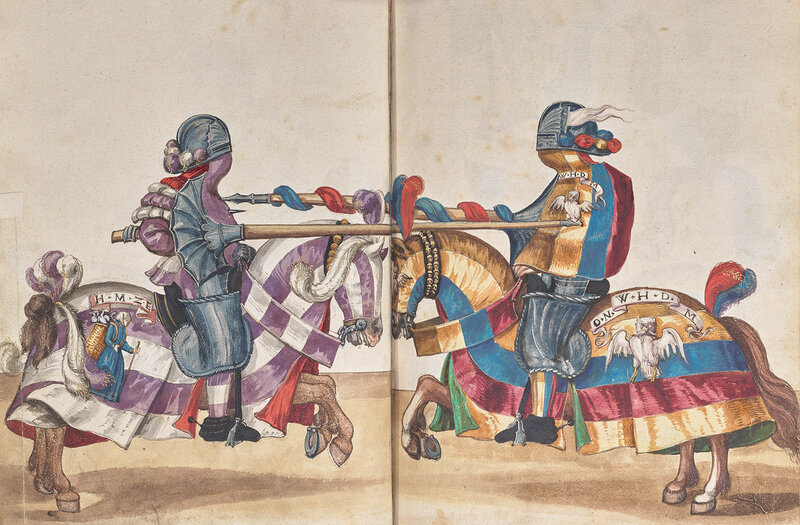 medieval period, official tournaments had elevated the joust to an art form. These chivalric dramas provided displays of knightly prowess that captivated noble audiences. Books like this one recorded in precise detail the participants, armor, and heraldry of contests held at courts throughout Europe. In this example, the artist captured a dramatic encounter between opponents, their lances about to crash into each other’s shields. The knights declare their allegiances through the colors they wear and the heraldic devices on the fabrics covering their horses. In the palaces and châteaux of late medieval and Renaissance Europe, religious faith often found expression in luxurious material form. Noble patrons had commissioned illuminated prayer books to guide their devotions since the thirteenth century, and at the Renaissance court these luxurious manuscripts advertised wealth and good taste as well as piety. Sought-after court artists produced small illuminated books that could be worn as fashionable accessories, their decoration imitating the elegant fabrics, precious metals, and glittering jewels that adorned the residences of Europe’s elite. 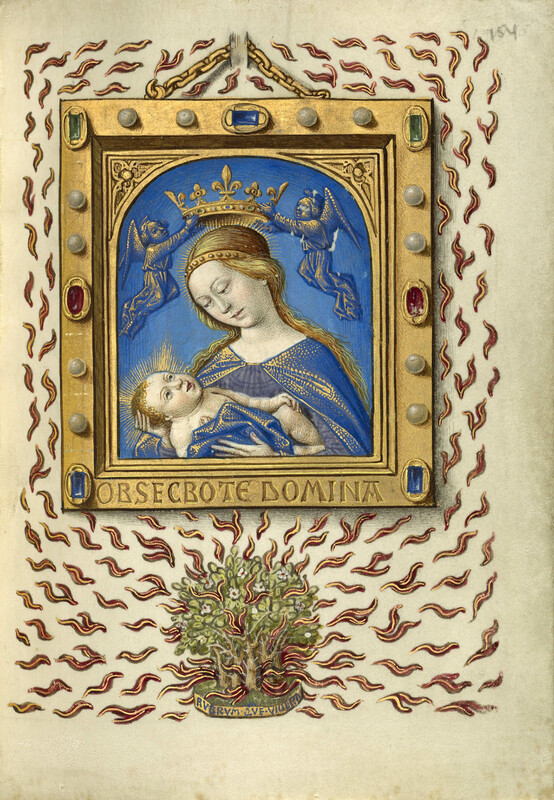 Georges Trubert, the official court artist to Duke René of Anjou, illuminated this striking image of the Madonna and Child surrounded by the flames of the Burning Bush. In a masterful display of three-dimensional illusionism, Trubert depicted the subject as an enamel plaque encased by a golden, jewel-encrusted frame hanging from a delicate chain that appears to pierce the parchment support. Duke René, presiding over his court in Anjou, was a close relation of the French monarch and an active patron and collector of art. The illuminations in this book provide glimpses of the precious metalwork he cherished, even though the objects themselves no longer exist. the king of France. 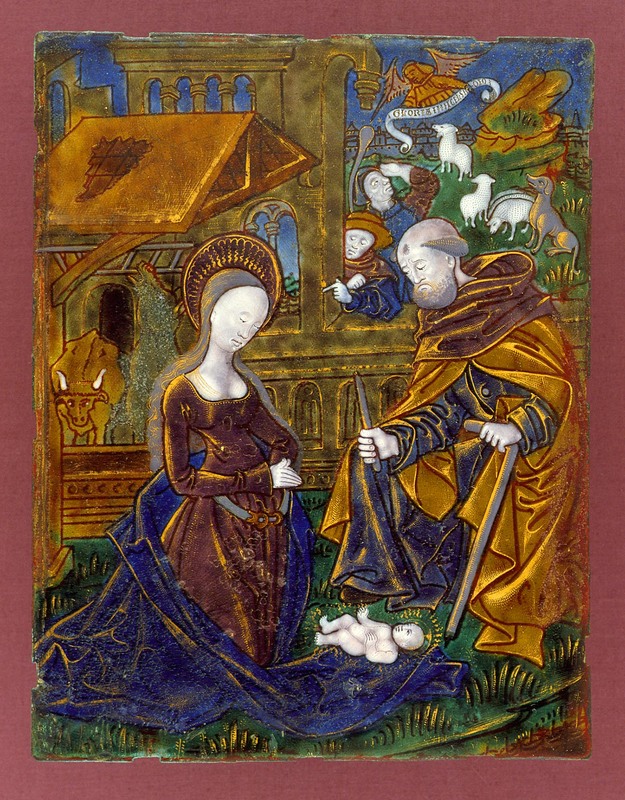 The artist likely worked in illumination as well, which required similar stylistic techniques and incorporated many of the same devotional images, such as those in books of hours like the one by Trubert above. The exhibition concludes with a display of illuminated manuscript leaves from the court of King Louis XIV at Versailles, where the splendor of European court life reached its apex in the seventeenth century. The display of heraldry, personal emblems, fine textiles, and luxury books continued to affirm social standing and good taste. Ultimately, the very trappings of magnificence that once cemented the king’s authority would help spark a revolution. Despite the proliferation of printed works, individuals with the means to do so continued to commission illumination, a luxurious medium that was still prized in the collection of Louis XIV. Emblems—symbols that combined image and text—readily accommodated mottos, devices, and heraldry from earlier periods. Illuminated by the royal artist, the designs of these leaves may have been intended for incorporation into the borders of royal tapestries. 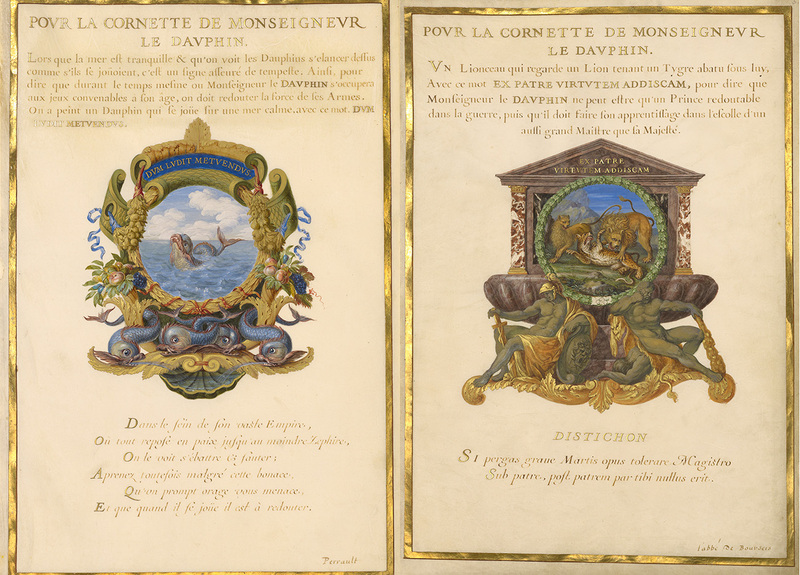 The emblems contain a dense web of symbolic connections to the French crown, including the cockerel, a symbol of France itself, and the dolphin, a reference to the dauphin, the heir to the throne. The array of objects that comprised the visual environment of the medieval and Renaissance courts of Europe might seem at home under glass, but these were things that members of the elite class used and encountered every day. As the curator of the exhibition, I hope these objects not only illuminate life at court in centuries past, but also encourage visitors to contemplate how spaces of leisure and luxury are created and communicated today. I’m the Assistant Curator in the Manuscripts Department at the Getty Museum. I hold a BA from New York University and an MA from Hunter College-CUNY. I completed my PhD at the University of Pennsylvania with a dissertation on late-fifteenth-century manuscript culture at the courts of France. My research interests include the interaction of manuscript and print at the end of the Middle Ages, hybrid books, late-medieval and Renaissance court culture, and royal patronage of the arts. This is a great exhibit. 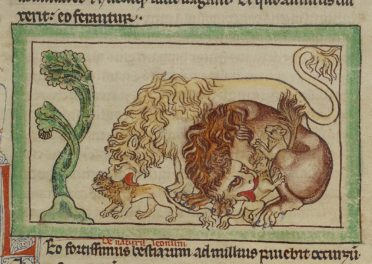 With regard to the tournament book, it would be much appreciated if you will advise if any of the heraldry has been identified as to family names. Thank. you.